With Victoria’s oldest sprung dancefloor, the Palais-Hepburn, set in the enchantingly picturesque countryside of Hepburn Springs (neighbouring township of Daylesford), has been everything from a movie theatre to a performance venue, even an ice-creamery, and has successfully drawn musicians and performers from around the world for nearly 100 years. As the entertainment jewel in the Victorian spa country’s artistic crown once upon a time, it’s no secret the heritage-listed building has been suffering a state of decline for many years, despite the various attempts at renovations to bring back that sparkle. Now, the long wait is finally over. Under the reigns of two inspired, community-minded visionaries, Richard and Brendan, the Palais-Hepburn is once again ready to shine following extensive restoration works last year. 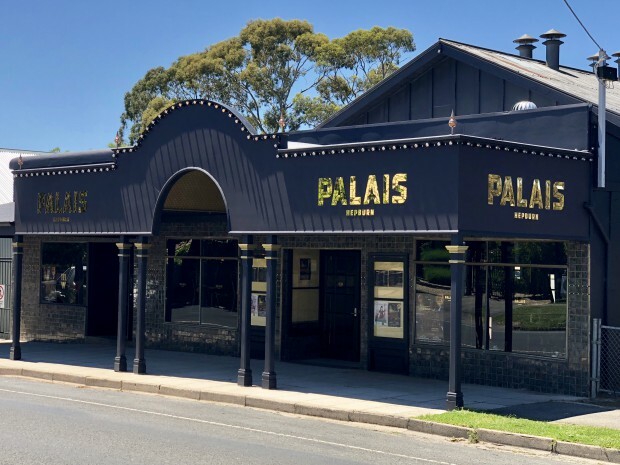 With fresh blood, bright ideas and an official opening set for the end of February, the goal is for the Palais to not only become the premier music venue in regional Victoria, but to also become a venue utilised by the wider community. Since winging its doors open in November, the venue has already injected a new sense of life and appreciation of the arts into the community. Maintaining the old art deco charm, the restored venue boasts a modern twist with fresh colours, stunning curtains, gold shimmering signage, an extended stage, beautiful lush finishings and polished floors ready for music lovers’ feet to tread once more throughout its three sections – including a new wine store. “It seemed like this sad empty space so you can feel the energy returning; it’s exciting to be in here now and as we have more music and more events on it will feel that space again. It’s been longing for it,” Emma continues. With the aim of bringing high-class entertainment, annual and one-off events, dance classes, workshops, boutique acts, comedians, and community festivals back to the region for people of all ages, it’s clear the team has the community, as well as the tourists, at the heart of the operation. “Our main direction is to just have this music venue stand as a full multi-art capacity venue which caters to community, families, the young and the elderly, and with this vision we could really bring it forth and make this a long standing relationship with the community,” Richard explains, who saw the potential of the venue returning to its original state after coming in as a designer to renovate the property towards the end of last year. On the entertainment front, The Palais is already re-claiming its crown with the venue having already seen a slew of musical talent, including solo acoustic indie pop triple j unearthed winner Yazmindi, DJ Pancho combo and Adrian Deakin Piano. There’s also a healthy roster of upcoming talent as well with America’s Got Talent’s HANS on Saturday February 2 who will be thrilling the Hepburn audiences around the globe with his own fabulous brand of critically acclaimed cabaret; the well-known and well-loved Freya Josephine Hollick who will be showcasing her classy feral fusion of country on February 8; a special Valentine’s Day performance from Adrian Deakin Piano serenading all the love birds out there, and Forte favourite Dan Sultan on February 23.